Over the last few years, we’ve seen the instructional strategy pendulum swing over to encouraging more use of evidence by students to solve authentic problems. And there’s tons of stuff out there to help us and students make sense of primary and secondary sources. You’ve got the Library of Congress primary source analysis worksheets. You’ve got the awesome stuff bySam Wineburg and Stanford. There’s the DocsTeach site by the National Archives as well as all of their document analysis lessons / worksheets. And lots of things like Historical Thinking Matters and Historical Scene Investigation. But a lot of people don’t seem to be aware of the excellent work that the History Project at the University of California, Irvine does with helping student evaluate evidence. We have been perhaps overloaded with Wineburg’s stuff so much that we don’t think that we need to go out and look for other types of tools. Don’t get me wrong, Sam. I absolutely love your stuff. Sourcing, contextulization, corroborating. I am all in. But we always said that it’s okay to date other people. And the History Project has some useful stuff. 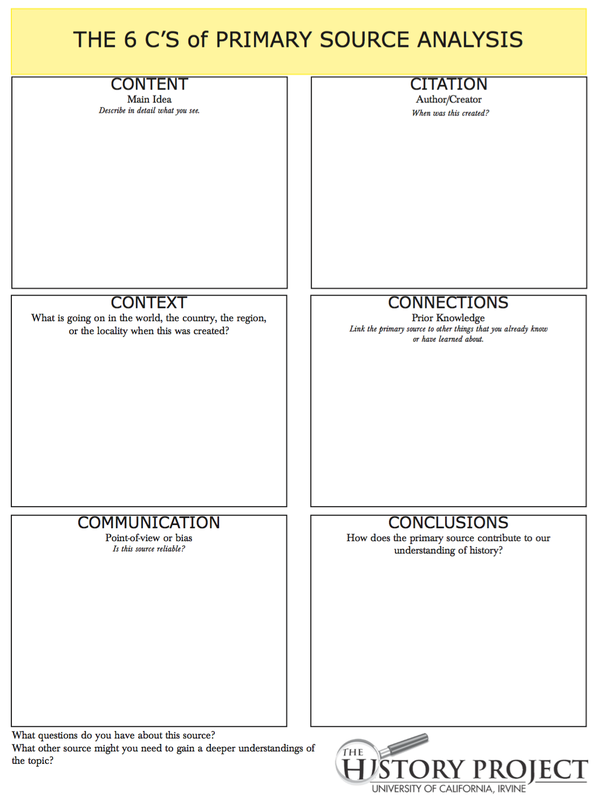 I especially like their 6 C’s of Primary Source Analysis graphic organizer. Give the 6 C’s a shot. A few extra tools in the tool belt never hurt anyone.